The main focus of settlement in this part of the Spey Valley was for many centuries on the south side of the river, at Ruthven. A castle existed here from 1229 on the mound now occupied by the walls of Ruthven Barracks. By 1371 Ruthven Castle was home to Alexander Stewart, Lord of Badenoch, and younger son of Robert II. "The Wolf of Badenoch" is best known for destroying Elgin Cathedral, and much of Elgin in 1390. He had been excommunicated by the Bishop of Elgin for marital infidelity: this was his response. 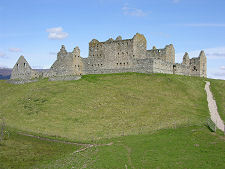 Ruthven Barracks was completed in 1721 on the site of the earlier castle, but reduced to its current state by Jacobites retreating from Culloden in 1746. 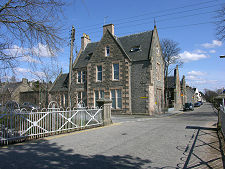 The military road contemporary with the barracks crossed the Spey at a ford near the Kirk of Kingussie, though at the time there was no village here, just a few cottages gathered around the church. This all changed in 1799. 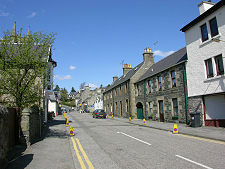 The Duke of Gordon decided that the parish needed a village, and the planned settlement of Kingussie was laid out. It grew only slowly at first, but was given a boost when the River Spey and River Laggan were bridged in 1808 and 1815, placing Kingussie on the new or improved main roads from Inverness to Perth and to Fort William. Another boost was given by the resettlement of tenants cleared from their lands in surrounding areas to make room for sheep. 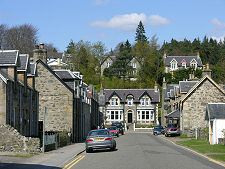 Kingussie had grown significantly by the time the railway arrived in 1863, prompting its transformation into a Highland resort. 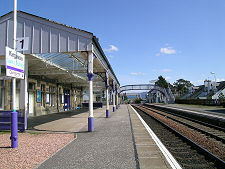 The imposing railway station lies just to the south of the centre of the village. Golf came to Kingussie with the launch of an 18 hole course in 1890. 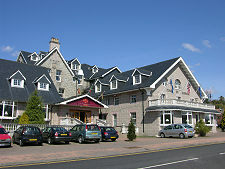 The moorland course lies to the north of Kingussie around the valley of the River Gynack. Continuing the sporting theme, Kingussie is also well known for its links with shinty. 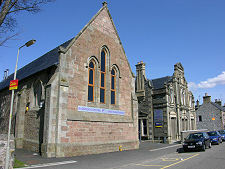 The governing body for the sport was formed here, and the village's shinty team has enjoyed dramatic success over many years. 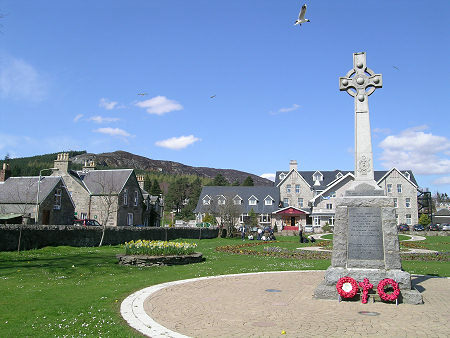 Today's Kingussie reflects its history, being well laid out to a regular pattern and especially rich in fine stone villas and hotels. 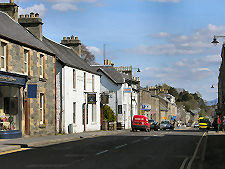 Particularly striking in the centre of the village is the Duke of Gordon Hotel. This was built in 1906, though the much more modern looking building you see today has been considerably expanded following a fire in 1999. A range of other hotels, guest houses, B&Bs and other accommodation providers are also available in the village. 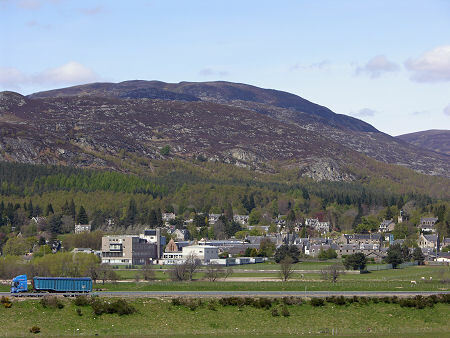 Kingussie has strong links with Scotland's national industry: distilling. A large distillery called "Speyside" was built here in 1895, though it went out of business in 1910. In 1991 the Speyside Distillery Company, named in recognition of the earlier distillery, started production in the newly built Speyside distillery at Invertromie near Drumguish on the south bank of the River Spey a couple of miles east of Kingussie. And Drumguish is the name under which the output is marketed. 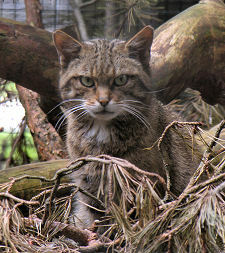 Not far from Kingussie is the excellent Highland Folk Museum, while a little over three miles north east on the B9152 is the Highland Wildlife Park, where visitors can experience Scottish wildlife as well as endangered animals from mountainous and tundra regions around the world.